The history of Jamia Masjid is a reflection of the history of Kashmir. A monument of resistance politics, the mosque has been witness to political uprisings against injustice and tyranny. Bilal Handoo documents the history of this colossal structure and how modernity is threatening its architectural grandeur. The Legend of Jamia Masjid — Photo:Bilal Bahadur. 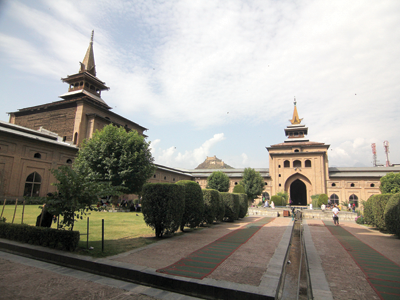 Standing tall in Nowhatta in the heart of Srinagar city from the last 610 years, the colossal structure of Jamia Masjid, the grand mosque of Kashmir, has been witness to a palette of historical events. The history of Jamia Masjid is in fact a reflection of the history of political uprisings in the state. Thousands of people congregate here for prayers, especially on Fridays, and it is the biggest mosque in Kashmir known for its peaceful and tranquil ambiance. While the other heritage structures in Kashmir are inching towards their deplorable decay, the grand mosque remains steadfast in maintaining its charm and splendor. Inspired by Indo-Saracenic architecture, Jamia Masjid has an area of 384 X 381 feet. It is quadrangle in shape, roughly square, with four minars; one in the middle of each side covered with a series of pyramidal roofs which terminate in an open turret crowned by high pinnacle. The minars are connected by spacious halls, whose principal feature is the vast array of 378 wooden columns which support the roof. On the outside, the mosque is decorated with yellow poppies lining the mossy brick paths and lush green parks. Jamia Masjid can accommodate more than 33,333 people for prayers at one time. There is a square garden in the middle and the mosque is surrounded by wide lanes on all the four sides. Large entrance gateway is covered with a pyramidical roof surmounted by a square open pavilion (brangh) with a spire on top. At the entrance of the mosque, an architectural document by INTACH, an NGO, welcomes the visitors, “Jamia Masjid is a local adaptation of the enclosed courtyard type mosque plan prevalent throughout the Islamic world,” it reads. The main entrance on the southern side consists of a recessed portico leading into an inner courtyard based on the traditional chaar bagh plan with a tank at the centre. The court which was originally planted with a series of chinars is enclosed by arched liwans (cloisters) covered with two tiered sloping roof. The western wall of the cloister houses a black marble mehrab with beautiful calligraphic work. Ninety nine attributes of Almighty Allah have been engraved on it. The courtyard is made up of pointed arched, brick arcade which lends a solemn atmosphere to the whole area. The upper clerestory is reached through twin staircases located in the jamb of the arch along the western fa?ade. The compound is bisected by two broad paths which have been planted with cypress trees. The water tank in the courtyard was originally fed by a water channel known as Lachma Kul. The foundation for the mosque was laid by Sultan Sikandar Shah Kashmiri, father of Sultan Zainulaabdin (Budshah), a ruler of Kashmir in 1398 AD. The construction was completed in 1402 AD. Right from its inception, tragedies have been inherent to the mosque. The magnanimous mosque was damaged by fire on three occasions but the damaged portions were restored after every disaster. Historical records suggest a large conflagration reduced it to ashes in 1479 AD. The reigning sovereign, Sultan Hasan Shahm, then set about its reconstruction with greater splendor. Unfortunately, the king died before completing his task, which was then brought to a successful end in 1503 AD by Ibrahim Magre, Commander-in- Chief of Kashmir forces under the reigns of Muhammad Shah and Fateh Shah. In 1620, under the rule of Jehangir, a severe conflagration again broke out in Srinagar and destroyed twelve thousand buildings including Jamia Masjid. King Jehangir ordered its reconstruction which took 17 years. Malik Haider of Tsodur, a historian of Kashmir, was entrusted with the execution of the work. In 1674 AD, third blaze consumed Jamia Masjid. It is stated that when Aurangzeb heard of the accident, he first enquired whether the chinars were safe for ‘the mosque could be rebuilt in a short time. A full-grown chinar can never be replaced.’ He engaged all the bricklayers and masons of the city and the mosque was completed within three years. The last restoration work was carried out under the reign of Maharaja Pratap Singh. Today, this mosque stands tall like the pride of Srinagar, holding within itself rich stories from the past and calling all Muslims to pray five times a day. While delving into the origin and history of Jamia Masjid, the name of Maharaja Pratap Singh surfaces several times as it was during his reign that the maintenance and repair works of the mosque was carried out. Singh enthusiastically encouraged the reconstruction of Jamia Masjid many times and even offered financial assistance. The mosque is also known as Buta Masjid (Buddhist Mosque) as the site is said to have housed a Buddhist monastery by the name of Tsifsung Tsublak Kanj. Every year, thousands of people gather on the last Friday of the holy month of Ramzan to offer prayers, “We regularly offer recitation of holy sermons from Islamic scripts. People from all over India and also from other countries are frequent visitors. Jamia Masjid can accommodate more than 33,333 people for prayers at one time — Photo:Bilal Bahadur. In Ramzan, a sea of people assembles here to offer congregational prayers. Offering prayers in Jamia Masjid is recompensed with a reward five hundred times more than in local masjid,” says a Ghulam Muhammad, a devotee. Over the period of time, Jamia Masjid has also turned out to be the place of match-making as well. Parents with their prospective grooms and brides descend here to seal their fate under the sacred sanctity of the mosque. “Match-making is not new here. People have been conducting such ceremonies for quite some time now,” Amin Shah, a devotee said. The Jamia Masjid falls under the domain of Anjuman-e-Auqaf, a private enterprise. The caretaker board of Jamia Masjid was constituted in 1975. Major source of revenue comes from 278 shops around Jamia Masjid and public funding. “Revenue is not fixed, it varies annually,” General Secretary, Anjuma-e-Auqaf, G N Farooqi said. Before the inception of Auqaf, income for the mosque used to came from elite citizens of the state. “Jamia Masjid was built for the sake of congregational prayers. For the welfare of the mosque, INTACH has taken over the reins of renovation. Re-modeling and facelift of the mosque are in the pipeline,” Farooqi says. It is not only the religion that has attracted the people of the state to this magnanimous structure. 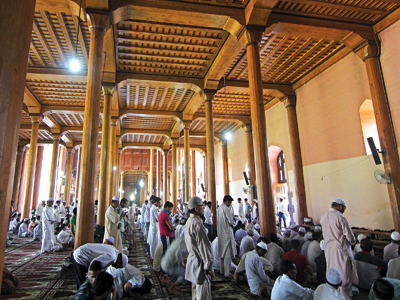 Jama Masjid has been a hot-bed of raging political discourse on the present turmoil in the state, and the politics that has unfolded in Kashmir has led to curbs and gags on congregations here. Its roots, however, lie deeper in history. It was reopened by Sikh Governor, Ghulam Muhi-ud-Din, in 1842 who spent nearly a lakh and a half of rupees on its repair. But for 11 years, rulers allowed prayers only on Fridays. “The Masjid would be opened for just few hours on Fridays and closed again,” Shams writes in his book. Ban on religious congregations in 2008 was seen as an attempt to choke the rebellion whose epicenter was the hotbed of separatist leaders, the areas in old city, particularly around Jamia Masjid. According to political analysts, Jamia Masjid is a politico-religious space and it has remained so before and after 1947. They say it has remained a centre of comprehensive power, alternative politics and alternative political discourse. “This is demonstrated by certain post-1947 political events like 1953, 1964 theft of Holy Relic from Hazratbal shrine, and Indira-Abdullah Accord of 1975. Late Mirwaiz Farooq led a demonstration against the Accord from Jamia Masjid to Lal Chowk,” a political analyst told a local daily during the recent shutdown of Jamia Masjid in 2010. For 21 Years, the mosque faced closure under the Sikh Regime of Maharaja Ranjit Singh — Photo:Bilal Bahadur. However, Jamia Masjid has also played a significant part in imparting religious education. The spread of modern education among Kashmiri Muslims due to the efforts of Mirwaiz Ghulam Rasul Shah, the mosque began to play a seminal role in the growth of political consciousness. “Mirwaiz’s ancestry has always played a crucial role in maintaining social, religious and political consciousness among people of Kashmir through the forum of Jamia Masjid,” Mr Farooqi says. Interestingly, the martyrs of July 13, 1931 were taken to Jamia Masjid after the police opened fire and 22 people were killed and hundreds injured. This day continues to be observed as Martyrs’ Day since 1931, a day when the exploited and suppressed people of Kashmir openly rebelled against the regime of Maharaja. Against the advice of Sheikh Muhammad Abdullah, a big crowd rushed to Srinagar central jail where Abdul Qadeer, a non-Kashmiri, was to be tried for treason within the central jail premises. The mob pelted stones at the governor, Raizada Trilok Chand, when he ordered their dispersal. This set all guns ablaze, resulting in devastating consequences. The bodies of the martyrs were laid in the compound of Jamia Masjid. Sheikh Abdullah, Mirwaiz Maulvi Muhammad Yusuf Shah and other leaders started delivering speeches against the Maharaja. At the suggestion of Khawaja Noor Shah, all the martyrs were buried in the compound of Ziarat Naquishband Sahib, Khanyar. The soldiers arrested about 700 Muslims in the city. The next day, the leaders of the Muslims, namely Sheikh Muhammad Abdullah, Chaudary Ghulam Abbas, Moulvi Abdul Rahim and Sardar Gohar Rehman were arrested and Sheikh Abdullah was locked in a solitary cell of the Hari Parbat Fort. The Maharaja had failed to curb this upsurge and appointed Pandit Hari Kishan Koul as the new Prime Minister of the state and issued orders for the release all political prisoners except Abdul Qadeer Khan Ghazi who was given five years rigorous imprisonment. A compromise was reached between the leaders of Kashmiri Muslims and the Maharaja through the efforts of Maulana Abdul Kalam Azad. At a public meeting in Jamia Masjid, the Muslims cursed both Shiekh Muhammad Abdullah and Mirwaiz Maulvi Muhammad Yusuf Shah, accusing them of compromising the sacrifices of 1931 Martyrs. But both of them explained in their speeches that they will not serve as traitors and will shed their blood, in case the Maharaja fails to redress their grievances within a month. In his speech at the Jamia Masjid on July 10, 1931, Sheikh Abdullah had said that “Maulana Abdul Qadeer Khan Ghazi has been prosecuted for the cause of Islam and for the Kashmiri Muslims. He asked the people to pray for his acquittal and show complete solidarity with him.” In his another speech, he had asked the Kashmiri Muslim to prepare themselves for sacrifices for the sake of Islam. It was this historic mosque which proved to be the launching pad for the Shiekh Muhammad Abdullah and his towering stature in Kashmir political space. According to the present day historians, Sheikh Muhammad Abdullah was introduced into Kashmiri politics at Jamia Masjid by Mirwaiz Muhammad Yusuf Shah. “This became turning point for leadership of Sheikh Muhammad Abdullah and gave real vent to the molten lava of Kashmiri anger which was brewing since silk factory uprising of summer of 1924,” a political pundit says. In Sheikh’s own words, “The year 1930 dawned. How could I have known that the nation was on the brink of an eruption? The trampled pride and hope of the people of Kashmir was like molten lava to flow. Nature fanned the embers which were smoldering inside me. It was left to me to take the lid off the volcano’s mouth”. In spite of his avowed secular credentials, Sheikh Abdullah never severed his mysterious political ties with the Masjids and shrines till his death. 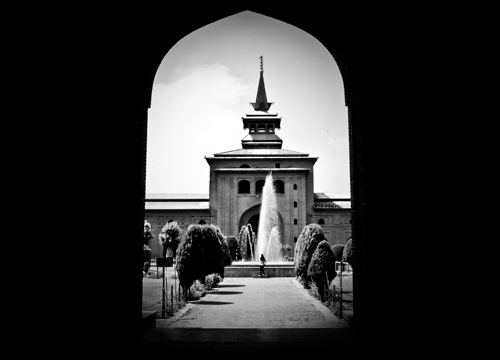 The Jamia Masjid served as the principal Friday mosque for the entire Srinagar city till early 20th century. The building is one of the best preserved examples of the traditional Kashmiri architecture, which makes it absolutely necessary to maintain its original character and architectural unity of the building. Although the mosque is in fairly good condition now, it suffers from a series of ill conceived alterations and renovations which threaten the original architectural fabric of the building. The alterations which include the addition of modern window frames, paint and polish work covering the walls, and the wood work of the building don’t go well with the ancient architectural grandeur that this mosque is known for. less researched, superficial copy. please do a copy that becomes a reference. that is what is expected of you.